I will train you to build and lead peer advisory groups for owners of small businesses that I describe here, using the approach that has been successful for me for over twenty years. Who this is for. This training is aimed at consultants, coaches or other professionals who already have experience advising small business owners. If you prefer working 1 on 1 with small business owners, this program is also relevant for you. How I work with you. We’ll work one on one by phone and online. If you are close enough, I will invite you to visit meetings of existing groups. I will train you over several months as you build and launch a group. After that, we can arrange ongoing support at the level you need. Here's a group in action. – Admin side of running a group. Pricing, billing, member tracking, etc. I will send you a set of my books and workbooks, including the leader training manual. Flow of the training. This is hands-on training. I will work with you as you are seeking members and building a group, then help you get it launched, then advise you on running successful meetings and one on ones with your members. I’ll help you adapt what I do to your particular situation and strengths, and to the kind of owners you will be working with. I’ve made this a six-month training program because that’s how long it usually takes to build a group and get it launched. I offer ongoing support because you don’t necessarily master everything in six months, and it’s good to have a kindred spirit to discuss things that come up in your group. been a few hours a month. I will send you materials, and give you “homework.” You’ll go out and apply what we’ve covered. Then we’ll talk again and debrief. You’ll have difficulties, and I’ll talk them through with you. We’ll try it and talk about it; tweak and continue. How we work together will model how you should work with your clients. I will certify your completion, but the real mark of your completion will be you running a healthy group, lucrative for you. Payment. Cost of the six-month program is $5,000. Ongoing support after this is $400 per month. –How to recruit and build the group. Who makes a good member; who does not? How to identify candidates. How to use the “four-legged stool” for marketing outreach. How to fill your pipeline. How to elicit referrals and introductions. How to get appointments, move the selling process along, become a trusted advisor, and not come across as a sales person. How to qualify prospects—and disqualify them. How to get to closure, come to agreement. – The concerns people raise about working with you, and how to address them. – How to use media to promote, including website, social media, outside media. What works and what doesn’t. 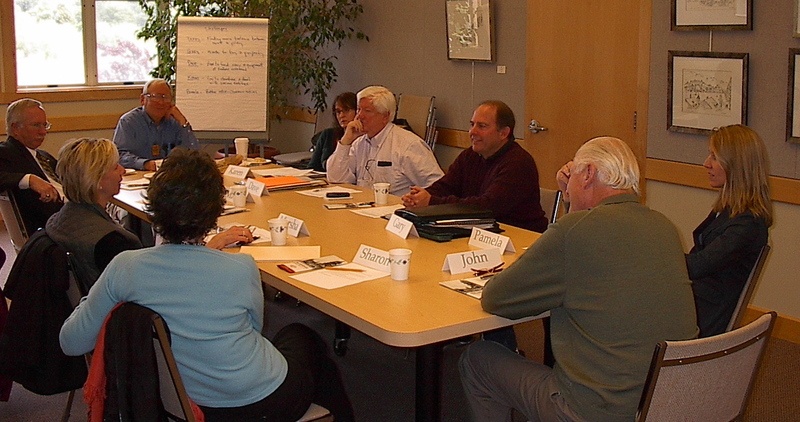 – Create a group-building plan, based on your strengths, e.g., are you better talking to groups or talking one-on-one? Profile your desired members. What size companies do you want to work with? Make a detailed list of contacts. – Public presentations, seminars, or workshops. What topics to use. How to use these events as effective marketing tools. – How to launch your first group. When is it time to launch? Where to hold the meeting. How to set the stage for greatest success. – How to keep a flow of new people to your group, and launch a second group when the time is right. Since we only select experienced facilitators, we assume you know how to lead a group; rather, we focus on specific Business Group processes. 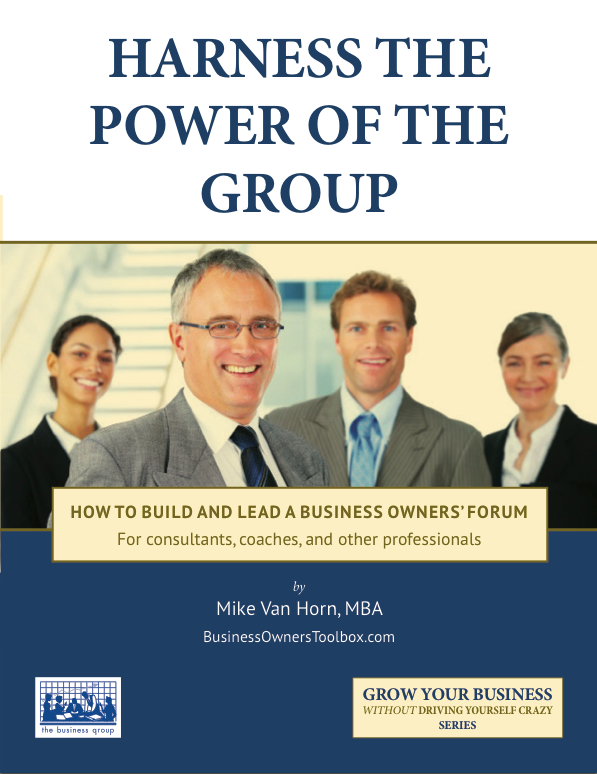 – Basics of “The Business Group” style. 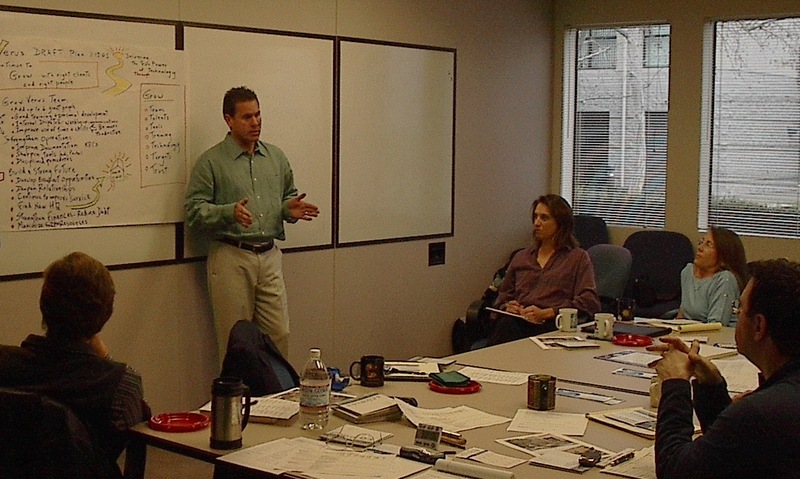 How to provide the most value to headstrong business owners. The mix of consulting and coaching, strategic planning and handling right-now problems. Building a sense of community in your group, because this is what keeps people coming back. – Show you how to run an interactive group, how to get your members to be the resources for each other, so you don’t do all the talking. How to do group problem solving. – How to lead exercises, how to create your own exercises, how to use outside resources to meet the needs of your members. – How to use the specific tools I have developed over the years working with business owners. – How to conduct one on ones with members between group meetings. – In your areas of strength, we’ll see how BG materials can supplement what you do best; in other areas, how our materials allow you to work effectively with business owners. 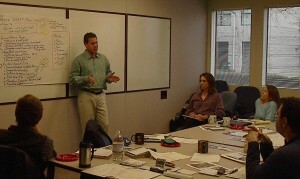 – How to lead planning exercises, have members present their plans, and use these as the basis of ongoing accountability. – How to price, do billing and collections. How to maintain member records. – I hold an annual 3-day offsite retreat for my advanced members, where we jointly tackle their toughest challenges. When you get to this stage, I can train you how to conduct these. – If you are in my area, I will invite you to visit a meeting of an established group. – I can come to your area to help you with a special event, such as a group launch or a major recruiting meeting. What are your areas of expertise as they relate to running a small business? Have you started and run businesses? What is your experience working with business owners? What size or kind businesses do you most like working with? What is your experience leading groups of professionals or business people? How could working with The Business Group benefit you? Why would you want to work with me rather than just starting a group on your own?